Successfully Added Wristband Anti-Loss Safety Set - Secure-Me Plus Model to your Shopping Cart. Keep your child and your valuables safe! 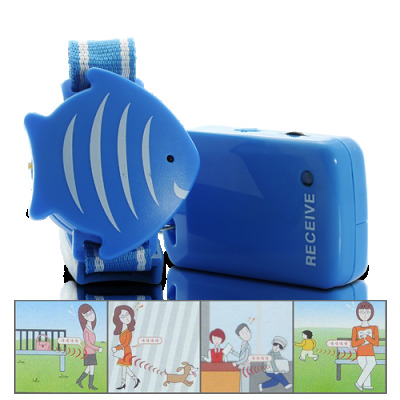 With this Wristband Anti-Loss Safety Set, popularly called the "Find-Me Nemo Wristband Alarm", you get a simple to use location finder + safety alarm device the whole family can use. Keep your family safe, never lose your purse or backpack, and keep your pet from wandering off too far. All this from one simple little product. Is it possible? Yes it is - with this Wristband Anti-Loss Safety Set - Secure-Me Plus Mode! This item makes a great gift for the whole family and if you are into making money, this is also a prime time product to feature on your own internet storefront. Get your wristband anti-loss safety alarm set today to give yourself and your family the peace of mind you deserve! Attach this to children, pets, backpacks, purses, etc. Power: AAA battery for receiver (not included), CR2032 button battery for transmitter (included). Secondary search mode which will help you find any lost object in a room. In this mode, if you go searching for your lost item, you get a strong beep and vibration as you move closer and closer to your objective, making valuables easier to find. Can I attach this to my cell phone or computer bag? You can attach this Wristband Anti-Loss Safety Set to any device, but D.I.Y. (do-it-yourself) installation may be required to get the transmitter to fit on some devices. Your best results will come when attaching the wristband to handles, bag straps, and people's wrists or legs.